The Kentucky Hospital Insurance Company, RRG (KHIC) is a Kentucky domiciled captive risk retention group owned by participating hospital members. KHIC provides professional, general and umbrella excess liability coverage to its members in Kentucky and Tennessee. The Company is governed by its members and is managed under contract by KHA Solutions Group, a wholly-owned subsidiary of the Kentucky Hospital Association. KHIC’s mission is to develop market, distribute and administer medical professional liability and related coverage programs to hospitals through the captive. 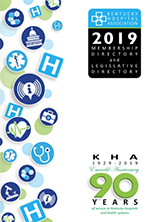 Operations are conducted and primarily distributed through KHA Solutions Group to members of the Kentucky Hospital Association and Tennessee Hospital Association. The goal of KHIC is to provide stable, comprehensive and competitive insurance coverage to its member insureds. Key objectives include creative and imaginative but sound underwriting, innovative product development, aggressive marketing and outstanding service. KHIC also seeks to achieve an outstanding reputation for cost containment, aggressive claims administration and a wide variety of risk management/loss control programs. The Company provides primary professional and general liability and umbrella excess coverage for hospitals. Primary coverage limits of $1M/$3M are provided on a claims-made basis for professional liability for all subscriber facilities and scheduled employees. KHIC writes umbrella excess coverage with limits up to $10M above scheduled underlying coverages including professional liability and general liability (inclusive of employee benefits liability), employer’s liability under workers’ compensation and automobile liability. With the emerging trend of physicians becoming employed by hospitals the KHIC program can also provide coverage for employed physicians. For additional information, contact Brian Brezosky or Lisa Hyman.